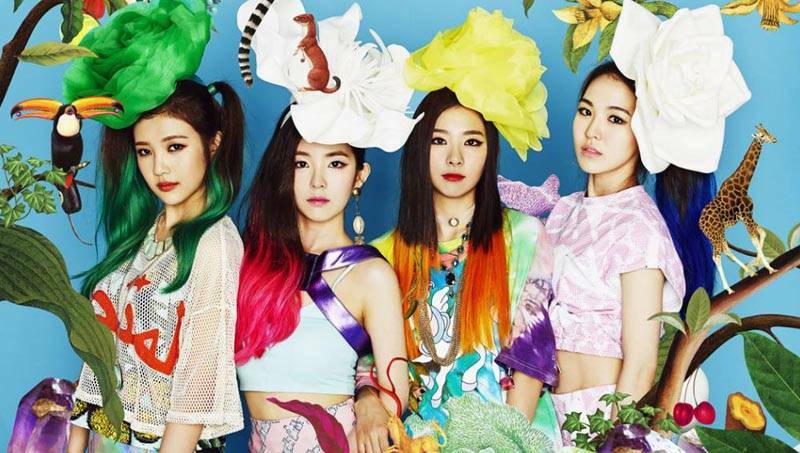 Red Velvet is a South Korean girl group under SM Entertainment. 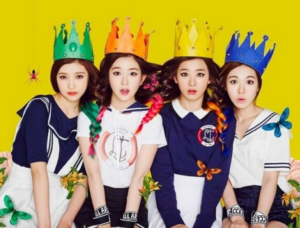 Originally consisting of four members, Irene, Seulgi, Wendy, and Joy, the group has experienced great success and received high recognition from the public. Later, Yeri joined the team, and the power of this group has been steadily climbing. SM Entertainment will never let the group down, and Red Velvet will strike off the long history of SM girls since the Girls Generation and F(x) era. 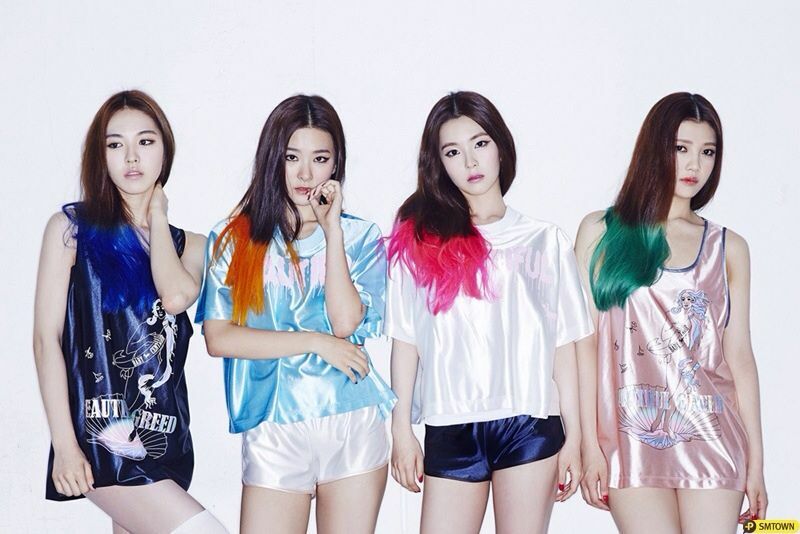 Let’s get to know more about Red Velvet. 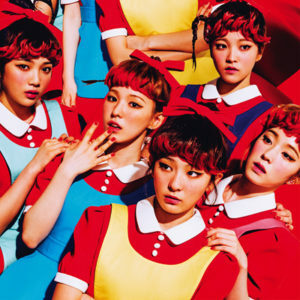 Red Velvet debuted on August 1, 2014 with the digital single Happiness. This song had a cheerleader concept, was easy-listening, very catchy, and the lyrics gave the listeners energy through the joyous and cheerful phrases. The music video itself looked unique with a jungle theme, while the girls wore colorful outfits similar to that of a cheerleaders team and had hair dyed in bright rainbow colors. With the strong, powerful choreography and a mix of sweet, joyful expressions, Happiness had been wrapped up perfectly as a single debut. Enjoy the Happiness music video by Red Velvet below. 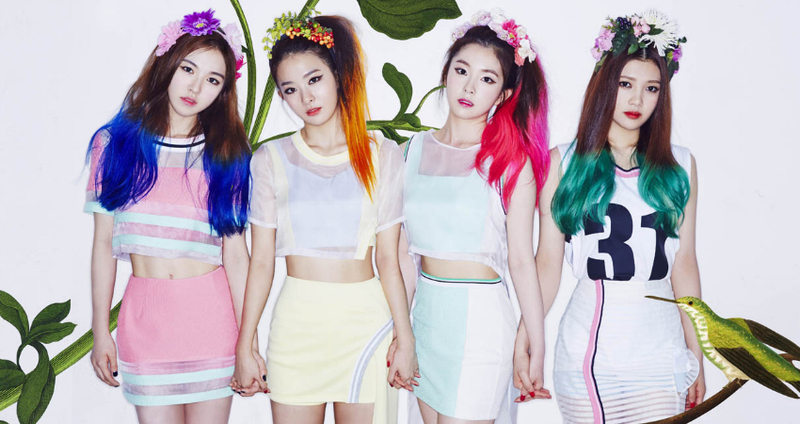 Red Velvet kicked off their first debut with the song Happiness, which was also their first live performance on television on KBS’s Music Bank on August 1, 2014. They wore red and white cheerleader outfits with numbers and colorful hair to attract the audience. Irene had pink highlighted hair with the number 43, Seulgi had orange highlighted hair with the number 20, Wendy had blue highlighted hair with the number 17, and Joy had green highlighted hair with the number 31. Joy was the only member who had her hair styled in two pigtails. The choreography was very complicated for the girl group, but the girls’ set brought a happy vibe to their viewers. Check out the live performance video below. Red Velvet released their first studio album on September 9, 2015. The concept of this album was very unique, just like Red Velvet themselves. They acted like dolls who had fun and played together, and never left their basic concept, which was acting tough yet still looking feminine. With this album, Red Velvet reached the top of Billboard World Album Charts and reached the peak of Gaon Album Charts in South Korea. This album had many genres such as dance, electro pop, R&B, and hip hop. Dumb Dumb was the title song of the album, which you can watch the music video for below. Yeri had just joined the team as the youngest member since the Ice Cream Cake era. Her existence added a new color to Red Velvet’s look. Yeri completed the team with her cheerful and adorable personality. Her real name is Kim Yerim, but she is known as Yeri, and was still a trainee when Red Velvet had first debuted in 2014. She joined the group in March of 2015 and took Joy’s previous position as the youngest member of the group. Below is Red Velvet’s track list. Who Is Red Velvet’s Leader? Irene is the only leader of Red Velvet, and her real name is Bae Joo-hyun. Irene was born on March 29, 1991 in Daegu, and in addition to being part of Red Velvet as a singer, Irene is also an actress and television host as well. She is always being compared to Girls Generation’s Yoona and F(x)’s Krystal, who are better known as her seniors at SM Entertainment. She attended Haknam High School in Daegu before joining SM Entertainment in 2009, and training for five years before debuting as Red Velvet’s leader. 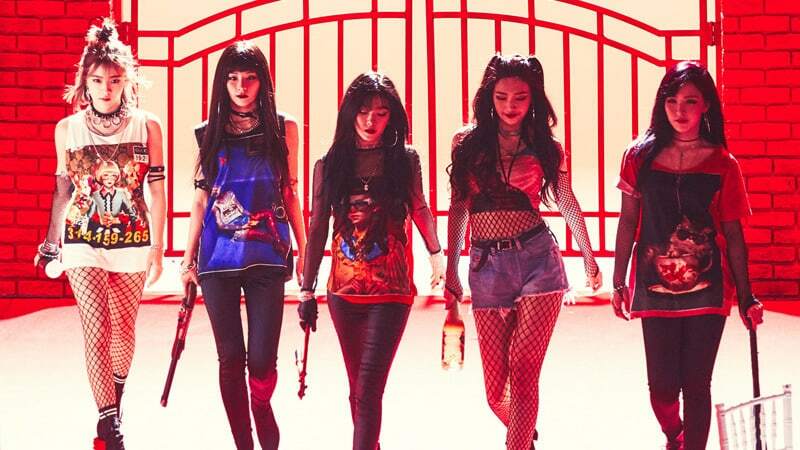 Are you excited for Red Velvet’s next release in 2018? We certainly are! Han Hyo-joo and Lee Jong-suk News: Secret Marriage, Rumor or Fact?